February 4, 2011 January 14, 2018 P.O.P. So extreme is the exaltation of St. Ronald that anyone who dares question his supreme greatness is subject to being branded a communist, a traitor, a terrorist coddler, a librul, a hippie and a bona fide baby-sacrificing devil worshiper. Well, we’ve never been prone to shy away from risk. So this is not only going to be a questioning of the Reagan myth but a shattering of it. Actually, it’s not just one myth but many. So let’s take a look at some of them, shall we? Myth # 1: He was an enormously popular leader who unified the nation and revived national pride. In almost any discussion about “Dutch” of more than 3 or 4 paragraphs, it’s just about inevitable that the word “popular” will crop up; and if it’s a discussion of more than a page or so, you’re just about guaranteed to hear the claim that in addition to being one of the greatest presidents ever, he was one of the most popular ever. But the numbers show that he was actually one of the least popular. In fact, since presidential approval began to be assessed during the FDR administration, only one president (Nixon) achieved a lower peak rating than Reagan. That’s right: even such alleged “failures” as Ford and Carter scored higher. Furthermore, he achieved the fifth-highest disapproval rating. Toward the end of his term, he was less admired by Americans than was Mikhail Gorbachev, for crying out loud. Far from unifying the country, he was one of the most polarizing figures in the nation’s history. Many of the actions his administration undertook (e.g., gutting environmental protections and REPEATEDLY supporting terrorists and brutal dictatorships) were fiercely and genuinely divisive (as opposed to the “divisiveness” manufactured by opponents of the Obama administration by deliberately distorting his record). For every American who was “proud” because of him, there was at least one who was embarrassed as hell. Myth # 2. He won the Cold War and brought down the Soviet Union. Gorbachev, when asked about this, replied, “That’s not serious.” But to many Americans, it’s dead serious. The official spin, which is already being injected into textbooks, is that by challenging the Evil Empire to a spending duel, he brought them to bankruptcy. Well, it certainly worked in reverse, bringing the U.S. to bankruptcy, but as for its effect on the USSR, there are at least a couple of problems with this assertion: (1) The Soviet Union began collapsing almost from day one; and according to CIA intel, it was already on the brink a decade or so before Reagan took office; and (2) The Soviets didn’t take the bait – they were vastly outgunned and they knew it. So think about it: if you were challenged to compare military toys by a giant, would you (A) rush headlong into a confrontation you know you can’t win, or (B) give some semblance of being competitive while allowing the giant to exhaust itself? 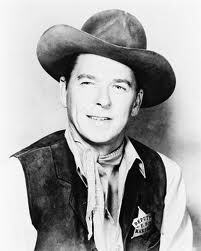 Far from ending the Cold War, Reagan’s cowboy bluster may have dragged it out unnecessarily. Worse, it sowed the seeds of a future conflict that would prove to be far deadlier. For in arming and training insurgents to rise up against the Russians in Afghanistan, the Reagan administration first enabled, then disillusioned a young hothead named Osama bin Laden. Myth # 3. He was a man of impeccable character. Only if “character” means lying through your teeth. A few years ago, a bipartisan panel of journalists rated the last few presidents on their mendacity, judging not only the number of lies told but also their severity. Reagan rated as the second biggest liar, being bested only by Bush the Younger (probably the all-time champion) [This was written before 45 came along]. Such evaluations always entail a certain amount of subjectivity, but in this case half the panel were right-wingers, who almost always defend their own at all costs. And there’s another factor to consider: unlike Dubya and his crew, whose facial expressions often gave them away, Reagan was a highly skilled liar. He delivered even the wildest fibs with such sincerity that you’d think he believed them himself (and maybe sometimes he did, but that’s another story.) Among other things, he lied to pad his own resume; he claimed, for instance, to have filmed the liberation of POW’s from a Nazi concentration camp, when in the real world he spent the entire war in California. He also liked to relate the anecdote of how during his early days as a sports broadcaster he once improvised for six minutes when the ticker tape went dead during the broadcast of a baseball game. The incident really did happen, but the announcer involved was Walter Cronkite, who related it to Reagan, who then adopted it as his own. Not only was he willing to lie, he was perfectly willing to take credit for other people’s actions. Often, in order to avoid giving fraudulent information, he would just say “I don’t recall” – a phrase he and his underlings used so frequently he could have trademarked it. During the hearings over Iran-Contra (and how was THAT for a character caper), his National Security Adviser, one Colin Powell, used the phrase 56 times. Another trick he used for evading questions was simply to pretend he couldn’t hear reporters because of whatever noise conveniently happened to be nearby. Myth # 4: He was The Great Communicator. If so, someone forgot to inform his own aides, who often found themselves scrambling after reporters at the conclusion of a media conference to explain what the prez really meant by that bizarre statement he just made. The truth is that many Americans were so infatuated with his avuncular persona, his glib delivery, his handy store of cocky one-liners, that they didn’t really pay much attention to the substance of his remarks. If they had, they would have noticed gaffe after gaffe after gaffe. And they also would have noticed something else: his thespian skills were most often used to avoid communicating. A prime example is when a journalist asked him, after he’d been shifting the blame for the economic mess to Democrats, whether he in fact accepted any share of the responsibility himself. To which he answered, “Yes, because for many years I was a Democrat.” The response became an instant classic in the Reagan hit parade. The question was quickly forgotten. Myth # 5: He reduced the tax burden. He certainly did. For the richest Americans. But most of us – most meaning about 80% – actually ended up paying more when he was done. Cut taxes? Yes, he did. Before he raised them. And raised them. And raised them. And so on, for the remaining 7 years of his administration. Funny how his admirers only remember the tax cut of the first year, even though it’s farther in the past. Myth # 6: Smaller government. Reagan increased the number of federal workers by 61,000. In contrast, Bill Clinton, supposedly a champion of “big government”, reduced the federal workforce by 373,000. Myth # 7: He was one of the greatest presidents of the Century, or even of all time. To put it charitably, there is a great deal of question about where he rates on the scale. Not the scale of greatness, but the scale of competence. Of his greatness there is no doubt, if greatness is defined as having an impact on history. By that standard, Genghis Khan, Napoleon and Hitler were all great leaders. But Reagan’s greatness was a product of neither malevolence (at least not his own) nor noble deeds, but rather of sheer disengagement. His hands-off style of “leadership” consisted largely in making stirring speeches and leaving the details to others – including his wife’s astrologer. While he smirked for the cameras and napped through meetings, an astounding total of 138 of his officials were convicted, indicted and/or investigated for unethical or illegal activity. He ignored the AIDS crisis until it started claiming celebrities that he personally was acquainted with. When Mikhail Gorbachev came to a conference eager to discuss arms reductions, Reagan entered and launched into a series of offensive jokes about Russians. When a Lebanese ambassador came to discuss a national crisis in his home country, he appeared to listen politely and then asked, “Did anyone ever tell you that you look like Danny Thomas?” When he signed the S&L deregulation bill in the presence of executives from the industry, he commented, “All in all, I think we’ve hit the jackpot.” The “we” he referred to did not include Joe Six-Pack – the rest of us paid the bill for that jackpot, to the tune of 150 billion. While preaching fiscal restraint, he amassed a national debt more than that of all the previous presidents combined (even though Congress, controlled by “tax and spend” Democrats, consistently allotted less money than he sought for his schemes). He first vehemently denied responsibility for the Iran-Contra affair, while telling lie upon lie, then later admitted, sort of, that he wasn’t exactly sure whether he authorized it or not. He set a record for most time spent on vacation by an occupant of the Oval Office – a record that would be shattered by George W. Bush [and again by 45], but Reagan was a pioneer in his time. Former Secretary of State Henry Kissinger noted of him, “It’s very unusual to have a president who’s not interested in policy at all. He would try to avoid policy discussions. When he couldn’t, he’d resort to his cue cards… He was an actor, the quintessential actor.” That may be the description of a “great man”, but it’s certainly not the description of a competent leader. So given his ineptitude, his failures, the unprecedented corruption that surrounded him, his disastrous impact on the economy and foreign relations, and his rather unpopular standing with the public, why is he being revered as a messiah? Glad you asked. Previous What Would We Do Without Hitler? How are people chosen to make a post in the group? May I post? I’d consider a guest post. What do you have in mind? During the 1980s I was genuinely oblivious to national politics, and generally felt that Reagan was neither as smart or as genuine as many people were saying, and at times he seemed to feel that being President was one of his more enjoyable roles. One thing I do give him credit for though, is his attitude after being shot during the same assassination attempt that left then Press Secretary Jim Brady, hopelessly crippled. Of course his wounds were nowhere near as serious as Brady’s but within a few hours of being whisked to the hospital Reagan seemed to be in a positive state of mind and said that he wished the shooter no harm. We may all have our feelings about his religious beliefs, but at least he deserves some credit for the stalwart and brave image he projected at that time. Brady of course, was in the long run the real hero, especially in his fight against adversity, not because he ever regained full functioning (which he didn’t) but because he never giving up hope, and continued to be a sharp intellect who laid the groundwork for much of today’s attempts to pass gun regulations. Its true that since he was already in this 70s during his tenure, Reagans inability to remember specifics may have been in part a legitimate result of onset Alzheimers, and as such, his aids did an artful job of covering for him. As far as outstanding traits, I have never associated those words with Reagan, but rather feel that President Obama is more deserving of our admiration and praise. He has had to deal with a Republican Congress (for most of his tenure) and one that was united only in its resolve never to make the President look good, and to never allow him to pass legislation which could have ended the burden of the Recession much earlier. He tried to enact many infrastructure bills, and incentives to keep corporate interests from doing business abroad, rather than in America–to mention just a very few of the opportunities he was denied! And when it comes to Charisma, let me just say that Obama seems like he has been the only genuine Earthling who is not constantly performing in ways meant only to convince voters of his possible lies. He may not have always been 100% above board, but when he talks in public or at a press conference, he gazes downward while struggling to find the right words with which to express his feelings–and I have been informed by Psychologists that, when we are remembering or struggling ot express abstract intellectual ideas, we look upward, but when we struggle to express our feelings we usually look downward as if to access teh aid of our hearts. Except for Obama, all the previous Presidents during my life time—beginning with Ike—have been somehow self conscious in ways that makes one wonder about their real abilities to communicate effectively. And some will try to get by while making absurd pounding gestures with their hands or some other silly motions. However, Obama has really tried to do the job he came for, because even while being constantly beaten down by political forces which gave him barely enough room to breath, they never actually defeated the value of his principles. Does anyone else know what I mean when portraying Obama as the real great communicator? I’d appreciate feedback about that observation, and could use an affirming word or two about what is so very clear to me. I think your characterization is absolutely correct.